The Adult Brad Manikin provides effective CPR and lifeguard training on adults. 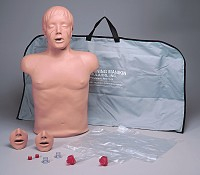 This CPR manikin includes 1 manikin, carrying case, and 3 airways and mouthpieces (one set installed). Simulaids adult male Brad manikin is constructed of soft, realistic vinyl plastic over polyurethane foam.